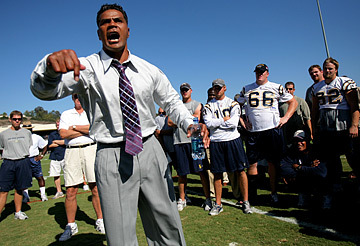 Junior Seau spoke to Chargers players, coaches and staff before announcing his retirement Monday. Yesterday he told the team he may unretire to play for the Patriots. FOXBOROUGH, Mass. » Junior Seau is looking to join the New England Patriots, just three days after the San Diego Chargers threw him a lavish retirement party. "Junior left a message for Chargers President Dean Spanos today alerting him that he may sign a contract and play for the New England Patriots," the Chargers said yesterday in a statement. "If, in fact, he chooses to continue his playing career, we wish him good health and the best of luck this season. Junior's place in the Chargers Hall of Fame awaits him when his career is over." The San Diego Union-Tribune first reported on its Web site that Seau was heading to Boston for a tryout and could sign by the end of the week. Seau's agent, Marvin Demoff, did not return several calls from The Associated Press. Reached in Chicago, where the Chargers will play the Bears tonight, Spanos declined comment. The Patriots did not immediately respond to a request for comment, but coach Bill Belichick recalled Monday that he got to know Seau in Hawaii in 1998 -- one of Seau's 12 Pro Bowl selections. The Patriots are looking for linebackers because Tedy Bruschi has a broken hand and Willie McGinest, another mainstay of their three Super Bowl titles, signed with the Cleveland Browns as a free agent. Chad Brown and Monty Beisel are also hurt. Seau grew up in suburban San Diego and starred at Southern California before the Chargers took him fifth overall in the 1990 draft. He led San Diego to the 1995 Super Bowl -- its only appearance in the NFL title game -- but was cut loose in the spring of 2003. He played three seasons in Miami before the Dolphins released him.